I'm very pleased and excited to show you what we have been working on the past few weeks. We all know the current scoreboard is very basic, so we decided to work on a new one. 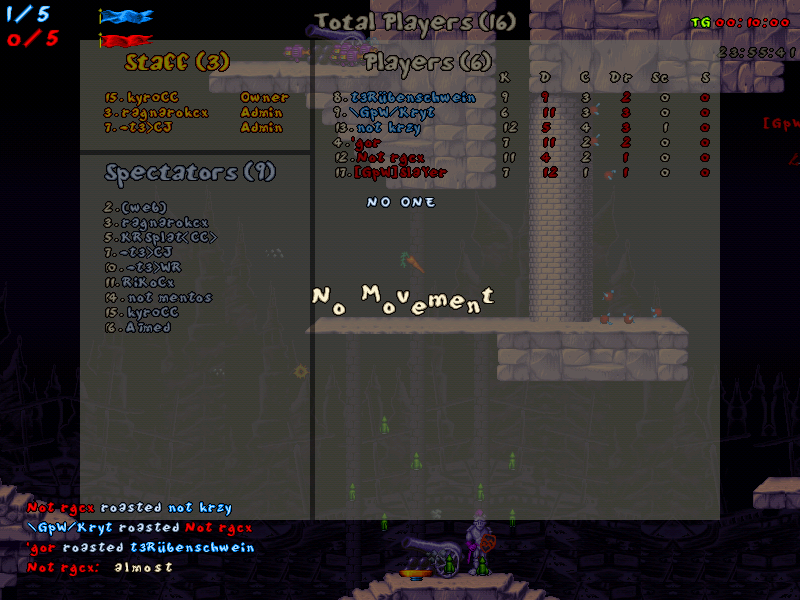 - detects total players in-game which would be easier to set max players instead of counting. - checks your kills, deaths, captures, drops, scores and solos. - You can reset scoreboard stats using !resetgame command. Stats and awards can be found [url=http://jazzjackrabbit.net/index.php?op=ntarchive&page=31]HERE[/url]! Most Valuable Player (MVP) of the whole tournament is: [GER]KeV! Congratulations! It was an exciting tournament overall with a lot of fun! Thanks to everyone who participated on one way or another! Many thanks to all the referees, all the broadcasters, the whole crew and all players who represented their countries! In case you missed any game, you can watch most of the replays by clicking on a specific game you want to watch! All information about the NT can be found in the menu to the left under 'Tournaments', when you click on [url=http://jazzjackrabbit.net/index.php?league=1&season=1&op=ntarchive]National tournament[/url]. You can start playing ladder matches again now! The season lasts until 100 points (not 200). If you play with Jazz, you can demand to enable the uppercut mutator which makes your uppercut slightly higher (thanks PurpleJazz). Hopefully this makes Jazz slightly more competitive. Finally, here is the mappool for the season (we added all levels except MD). National Tournament 2016 Final game is now over! [url=http://jazzjackrabbit.net/index.php?league=1&season=1&op=loosegames&id=95]Netherlands vs Poland[/url] (12:14 - 2:5; 3:2; 2:5; 5:2). In case you missed the game, you can watch the replay [url=https://www.youtube.com/watch?v=I8bpyXGMrm8]HERE[/url]. Congratulations to Poland for making it the 3rd time in total! It was an exciting tournament overall with a lot of fun! Thanks to everyone who participated on one way or another! Many thanks to all the referees, all the broadcasters, the whole crew and all players who represented their countries! There are 2 games still that need to be played before Friday the 12th (for 5th and 7th place). After that we will have a short break, and depending on how much active the community will be, we might organize another season of the national tournament with a slightly different layout. Stats and awards coming soon! The game for 3rd place between [url=http://jazzjackrabbit.net/index.php?league=1&season=1&op=loosegames&id=94]Finland and Germany[/url] (4:8 - 0:0; 2:2; 1:2; 1:4) is over! Germany placed 3rd, and Finland 4th. Congratulations! The game for 5th place between [url=http://jazzjackrabbit.net/index.php?league=1&season=1&op=loosegames&id=91]Egypt and United Kingdom[/url] (11:7 - 1:2; 3:2; 3:3; 0:4) is now over! Sadly we didn't have a broadcaster, but the game was free to join and watch. Congratulations to Egypt on winning the game and taking the 5th place. Congratulations to United Kingdom for being 6th, too! Expect stats and awards very soon! - Galactic Warfare, Distopia and Jungle's Edge have been removed for the duration of the next season as they were the most played maps. - Wicked Wood and Epitome return, as they were only removed for the duration of the last season. We will be closing the polls and most likely launching the next season on Friday! We just started Knockout Phase! In this thread u can see latest matches and upcoming ones. for your convenience I'll add every team's vetos. The match will start within the hour, waiting for worrier.. Team captains participating in the play-offs: Please post your map vetos in this thread. Please suggest any maps here that you would like to be considered for mappool in the next season! Welcome our new moderator Naps!